Where do old sweaters go when they’re past their prime? If they’re lucky, they wind up in Josh Title’s studio, destined to become fun companions for some lucky kids. Josh is the founder of Cate & Levi, a collection of environmentally responsible children’s products. He came up with the idea just before his first child was born, after being discouraged by the lack of responsibly-made toys on the market. He started designing, and today his Toronto studio is brimming with handcrafted toys and keepsakes made from recycled wool sweaters. Reclaimed wool is individually selected, based on color and texture, for each Cate & Levi hand puppet. Every design is special, and no two walruses, dogs, giraffes, monkeys, dragons or dinosaurs will ever be the same. But what they all have in common is the ability to inspire. 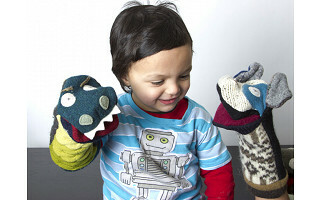 The puppets feed kids’ imaginations, and when playtime is over, they make cozy cuddling companions. 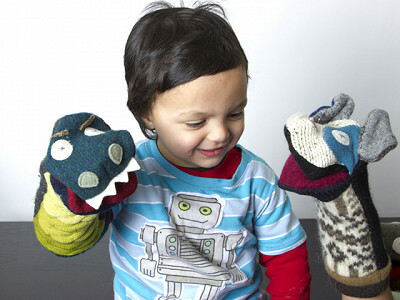 It’s a great second life for second-hand sweaters… and the kids who treasure the wooly creations. Hello Grommet Community! I'm Meredith from the Daily Grommet Team, filling in for Josh Title, founder of Cate & Levi. Unfortunately Josh is unable to be with us today, but I can answer any questions you may have. I really enjoyed working with Josh on this grommet and hope everyone loves the puppets as much as we do! Are the inside of the puppets itchy (with them being made from wool sweaters)? We have played with these puppets in the office and have not found them to be itchy. Hi - these are wonderful! Is there a difference in size for children/adults? Thanks! I am glad you love the puppets! They only come in one size, but will fit children and adults comfortably. While on a business trip to Toronto last year, our group was given the opportunity to visit the "puppet factory", and to create puppets to be distributed to children in need. The experience was a wonderful team building opportunity - and so much fun! Great creation, and a great company! Puppets are not available to ship to the US? All puppets are available to ship to the U.S. as well as Canada. Do you make a fox puppet? Do you make fox puppets? Fox puppets aren't available at this time, yet check back as they might add more to the repertoire. Am trying to order the dog and the giraffe puppets, but only the giraffe is showing up in my basket. Are they out of the dog puppet? @elaine kenzer - We did run out of the dog puppet but are getting more in to ship by February 6th and so we are still taking orders for them. I was able to add one to my cart, so I'm not sure why it's causing you problems. Try again, maybe it was just one of those cyber glitches. Where do old sweaters go when they’re past their prime? If they’re lucky, they wind up in Josh Title’s studio, destined to become fun companions for some lucky kids. Josh is the founder of Cate & Levi, a collection of environmentally responsible children’s products. 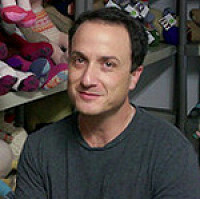 He came up with the idea just before his first child was born, after being discouraged by the lack of responsibly-made toys on the market. He started designing, and today his Toronto studio is brimming with handcrafted toys and keepsakes made from recycled wool sweaters.